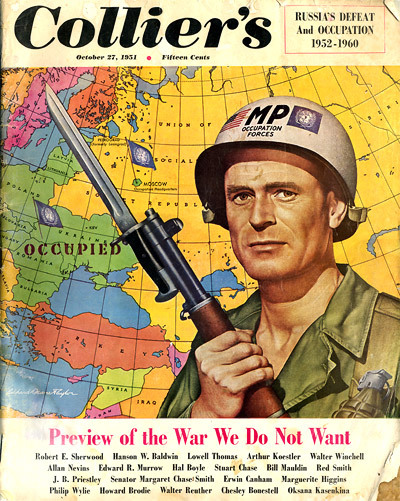 Collier's Magazine, a american magazine on October 27th 1951 devoted a entire 130-page issue to narrate the events in a hypothetical Third World War, in a feature article entitled Preview of the War We Do Not Want - an Imaginary Account of Russia's defeat and Occupation, 1952-60. Twenty writers, including Edward R. Murrow, Arthur Koestler, Philip Wylie, Hal Boyle, and Walter Winchell, contributed to the article. The war, in which the United Nations is victorious over the Soviet Union, takes place from 1952 to 1955. Nuclear weapons are extensively used, but do not have the apocalyptic effects envisaged in other speculative scenarios. In the scenario, Soviet and allied forces enter Yugoslavia in May 1952 to support an uprising organised by COMINTERN agents. After the Soviets refuse to leave, the United States and principal United Nations countries declare war. The US uses atomic bombs against Soviet strategic industrial complexes. Soviet forces then proceed to invade Germany, the Middle East, and Alaska. US forces are in retreat on all fronts, and Korea and Japan are evacuated. London, then Detroit, New York, and Hanford are hit with nuclear weapons. In the following year a second salvo of Soviet bombs hit US cities. However, the US suffers fewer casualties than before, having built up its civil defence. UN forces eventually manage to contain invading Soviet forces in the different theatres of war. On July 22 Moscow is bombed by B-36s with nuclear weapons (witnessed by Murrow as an embedded journalist), in retaliation for a nuclear attack on Washington, D.C. The US turns to psychological warfare by emphasising that the UN is fighting for the liberation of the Russian people, and support is provided to guerrilla forces in Soviet satellite countries. A suicide task force of 10,000 US paratroopers destroy the last remaining Soviet nuclear stockpiles hidden in the Ural Mountains. Soviet forces are kept pinned down in Yugoslavia by resistance fighters. In 1954, Lavrentiy Beriya becomes Soviet ruler; Stalin has mysteriously disappeared. Uprisings take place across the Soviet Union and satellite countries. UN forces push the Red Army back across Europe, and by year's end have reached Warsaw and the Ukrainian border. The Soviets are routed from Turkey and UN forces capture the Crimea. Vladivostok is seized by US Marines. Hostilities cease in the following year, and the Soviet Union plunges into chaos and internal revolt. The UN occupies parts of the Soviet Union under UNITOC, the United Nations Temporary Occupation Command. Assassination attempt on Marshal Tito's life, May lOth, precipitates Cominform-planned uprising in Yugoslavia. Troops from satellite nations of Bulgaria, Romania and Hungary, backed by Red Army, cross borders. Truman terms aggression "Kremlin inspired"; Reds call it "an internal matter." Third World War begins when Moscow, still insisting that uprising is "the will of the Yugoslav people," refuses to withdraw Red Army units. Stalin miscalculates risk: had believed U.S. would neither back Tito nor fight alone. U.S. is joined by principal UN nations in declaration of war. Neutrals include Sweden, Ireland, Switzerland, Egypt, India and Pakistan. Saturation A-bombing of U.S.S.R. begins. Avoiding completely population centers. West concentrates on legitimate military targets only. Principal objectives: industrial installations; oil, steel and A-bomb plants. Communists throughout West begin sabotage campaign. Trained saboteurs open attacks in U.S.
General Vassily Stalin, aviator son of Red dictator, becomes a UN prisoner of war. Red Army, under vast air umbrella which outnumbers UN planes five to three, attacks across north German plain, in Baltic countries and through Middle East. UN troops, fighting for time, retreat on all fronts, suffering heavy losses. North American continent invaded when Red Army, in combined air-sea operation, lands in Alaska, occupying Nome and Little Diomede Island. Reds A-bomb London and UN bases overseas. Far East "Dunkerque" takes place when, under unremitting air and submarine attacks, U.S. occupation forces evacuate Korea for Japan. U.S. A-bombed for first time when Red air force hits Detroit, New York and A-bomb plant at Hanford (Washington). Civil defense proves inadequate. Turning point in war's first phase reached when atomic artillery smashes enemy offensive on Christmas Day in Europe. U.S. A-bombed for second time. Bombers hit Chicago, New York, Washington and Philadelphia. Red submarines fire atomic-headed missiles into Boston, Los Angeles, San Francisco, Norfolk (Virginia) and Bremerton (Washington). Casualties greatly lessened by improved civil defense procedures. UN air forces finally achieve air superiority over battle fronts. Psychological warfare begins to play important role; propaganda emphasizes that UN is fighting war of liberation for Russian people; leaflet raids and broadcasts warn Russian people to evacuate areas scheduled for attack. Moscow A-bombed midnight, July 22d, by B-36s in retaliation for Red A bomb terror raid on Washington. Planes flying from U.S. bases destroy center of Moscow. Area of damage: 20 square miles. Suicide task force lands behind U.S.S.R. borders, destroys Soviets' last remaining A-bomb stockpile in underground chambers of Ural Mountains. Of 10,000 paratroopers and airborne units, 10 per cent survive. UN Genera l Assembly issues momentous war-aims statement known as "Denver Declaration." Underground forces in satellite countries receive arms and materials in UN plane-drops; highly trained guerrilla fighters parachute into U.S.S.R. to aid resistance movements and destroy specific targets. Severest rationing since beginning of war introduced in U.S.
Yugoslav guerrilla fighters begin to tie down large numbers of Red troops. A captured Soviet genera l reports disappearance of Stalin, reveals that MVD (secret police) Chief Beria is new Red dictator. Uprisings take place in U.S.S.R. and satellite nations. UN parachutes Russian emigres into Soviet Union to aid dissident groups. UN offensive begins on all fronts as West at last gains initiative. Red Army gradually retreats, then disintegrates under onslaught of UN air and ground forces. Three Red generals desert to UN forces. UN armor spearhead captures Warsaw, reaches Pripet Marshes in Poland. Another armored column crosses U.S.S.R. border into Ukraine. UN forces clear Asiatic Turkey and cross border into Crimea. Marines, in combined air-sea operation, capture and occupy Vladivostok. Hostilities cease as U.S.S.R. degenerates into a state of chaos and internal revolt. UN forces begin occupation duties in satellite nations and Ukraine. UNTTOC -United Nations Temporary Occupation Command—set up in Moscow.